A statement attacked a “national lie rooted in the Michael Brown incident,” among other non sequiturs. Robert Lewis Dear, Jr. has been accused of killing a mother, a veteran, and a police officer in a mass shooting apparently intended to terrorize patients at a Planned Parenthood clinic in Colorado Springs. Police officers in Colorado have every right to be angry about losing their colleague, Garrett Swasey. But the Colorado state police union is taking out its frustration on a group who had nothing to do with the Planned Parenthood shooting: protesters affiliated with the Black Lives Matter movement. The Colorado State Lodge Fraternal Order of Police posted a statement to Facebook about the November 27 mass shooting, in response to another police-union post about criticism of the police. 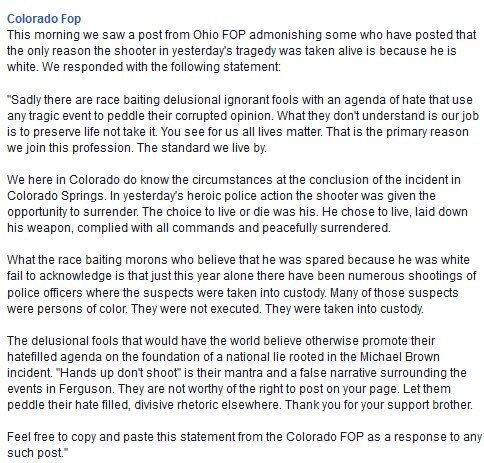 The Colorado FOP statement has since been deleted, but not before Think Progress and Colorlines caught it. The statement goes on to attack a “national lie rooted in the Michael Brown incident” and a “false narrative surrounding the events in Ferguson.” Read the whole thing below; there’s not exactly a great deal of narrative thread connecting the Colorado Springs shooting on Friday and the Ferguson shooting that launched the Black Lives Matter movement. “If anyone other than an angry white man like Robert Lewis Dear had killed a mother, a police officer and a war veteran in a mass shooting, you know and I know that heaven and earth would move to restrict and penalize and demonize anyone who even resembled or was remotely connected to that person,” writes Shaun King. That may not be the sentiment, exactly, that the Colorado police union had in mind. (“This morning we saw a post from Ohio FOP admonishing some who have posted that the only reason the shooter in yesterday’s tragedy was taken alive is because he is White,” the Facebook post reads.) But the subsequent response from the Colorado police union is in many ways typical of the reactions of police unions to the deaths of unarmed black men. The Louisville police union put out an open letter telling Black Lives Matter protesters and their sympathizers, “We’re done with you.” Baltimore’s police union called Freddie Gray protesters a “lynch mob” well before the night of scattered looting. The list goes on and on. In yesterday’s heroic police action the shooter was given the opportunity to surrender. The choice to live or die was his. He chose to live, laid down his weapon, complied with all commands and peacefully surrendered. These are the facts: Dear is accused of shooting and murdering three people, including a police officer, in an act of domestic terrorism. Dear battled with police in a five-hour siege. And yet, here is the Colorado police union using lionizing language to discuss the shooter, as if he were a model to which other subjects of law enforcement should aspire. As if critics of law enforcement should learn a lesson from him. “Sadly there are race baiting delusional ignorant fools with an agenda of hate that use any tragic event to peddle their corrupted opinion. What they don’t understand is our job is to preserve life not take it. You see for us all lives matter. That is the primary reason we join this profession. The standard we live by. The delusional fools that would have the world believe otherwise promote their hate-filled agenda on the foundation of a national lie rooted in the Michael Brown incident. ‘Hands up don’t shoot’ is their mantra and a false narrative surrounding events in Ferguson. They are not worthy of the right to post on your page. Let them peddle their hate-filled, divisive rhetoric elsewhere. Thank you for your support brother. Feel free to copy and paste this statement from the Colorado FOP as a response to any such post.